During the heyday of absinthe, Germany wasn't exactly known to be pioneering in absinthe manufacturing. 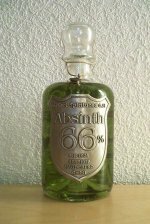 However, since the EU opened the path for absinthe to once again enter the scene, Germany was there to take it on. There are a lot of German absinthe brands available today. Most of them by poor quality, and leaning more towards the Czech style Absinth. There are some that are quite palatable, but they are few. Another one of those absinthes where the packaging cost more per bottle than what's inside. With a suggestion on the back label to mix the absinthe with an energy drink, I have very low expectations. This is also known as the "Absinth-Guide.de Sonderausgabe 2005" - the winner of the 2005 HG competition at Absinthe-guide.de. Made by Deep Forest, a member of that forum (and other international forums) and then realized in slightly larger scale at the Eichelberger distillery. 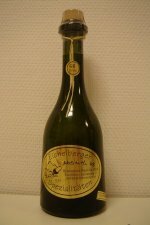 Most German absinthes coming out around 2000 are bitter, dry and marketed using the thujone levels and old myths. Tabu is different in one aspect. It's not bitter.